When rich and handsome Bing Lee comes to town, along with his stuck up friend William Darcy, things really start to get interesting for the Bennets and for Lizzie's viewers. But not everything happens on screen. Lucky for us, Lizzie has a secret diary. The Secret Diary of Lizzie Bennet takes readers deep inside Lizzie's world and well beyond the confines of her camera, from the wedding where she first meets William Darcy to the local hangout of Carter's bar, and much more. Lizzie's private musings are filled with revealing details about the Bennet household, including her growing suspicions about her parents unstable financial situation, her sister's budding relationship with Bing Lee, the perils of her unexpected fame, and her uncertainty over her future, and whom she wants to share it with. This is my family. If I can't be honest about them, then I'm not being honest about myself. This is my life, warts and all. And that's what I'm putting out there. Once I got upstairs, I couldn't stop grinning. And it took me a little while to figure out why. I wrapped my arms around me Dad's waist, and we forgot about the shards of crockery on the floor. We'd get them later. But at that moment, I was just so glad to be able to talk to my dad again. Sometimes, when you go for the pipe dream, you actually end up getting the pipe dream. Lizzie Bennet! Recently, I re-watched my beloved YouTube series, "The Lizzie Bennet Diaries" and immediately upon finishing knew I had to read The Secret Diary of Lizzie Bennet. I'd read a few reviews on the book and knew it it was the perfect time to read this "behind the scenes" addition. It also helped as I was able to "hear" the character's in my head - or in some cases, Lizzie's interpenetration of said characters - merely adding to me enjoyment of this novel. If you've seen "The Lizzie Bennet Diaries," the plot here is no surprise. What is nice though, is that we get a lot of extra information that we didn't get in the diaries. We see Lizzie's interactions with her mother and father, which I really enjoyed, and more of Jane, Lydia, Charlotte, so on and so forth. Not to mention, we find out more detail of what happened at the wedding/first encounter with Darcy and the Less, the events that occurred while Jane and Lizzie stayed at Netherfield, and Lizzie describes her day spent with Gigi and Darcy touring San Fransisco. I do wish, however, that some of the scenes Lizzie had filmed weren't transcribed. Fortunately there were only two and while I cannot remember the first one off the top of my head, the fact that Gratitude (Episode 98) is transcribed really bummed me out! I would have loved to know what was running through Lizzie's head at that point. But alas! I did love that Darcy's letter was "taped" in her diary though - that was a nice peak in to his character. 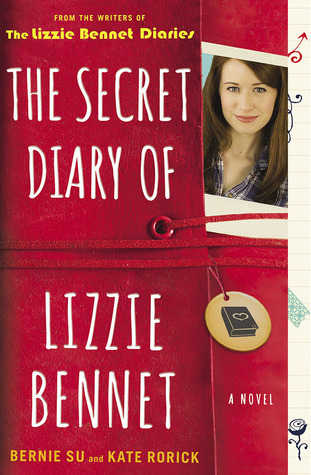 If you watched and loved "The Lizzie Bennet Diaries," I recommend adding to that experience with The Secret Diary of Lizzie Bennet. It's a fun and quick read that fleshes out - though the YouTube series did a pretty amazing job of doing so on its own - these characters and while everything is still from Lizzie's perspective, we get to learn her inner and deepest thoughts about what is happening around her and pulls us deeper into her world.